Your tag is precious and so sweet! What a sweet little christmas tag! That cat is cute! Love that sweet kitty stamp! Darling tag! I can't get over how cute these little stamps are. The kitty is so sweet. I can't wait to get some stamps to play with. I like the way you added the green and white twine over the ribbon and the sparkle on the tag. Great job. The twine really complements the ribbon. Great job!! Such a cute tag! Does have just a touch of twine - excellent! Love the colors - this is a fun project. This is as sweet s can be! Love all of the patterns and the little jingle bell!! Adorable tag--I like the twine on top of the bow. Kerri, this is absolutely DARLING! 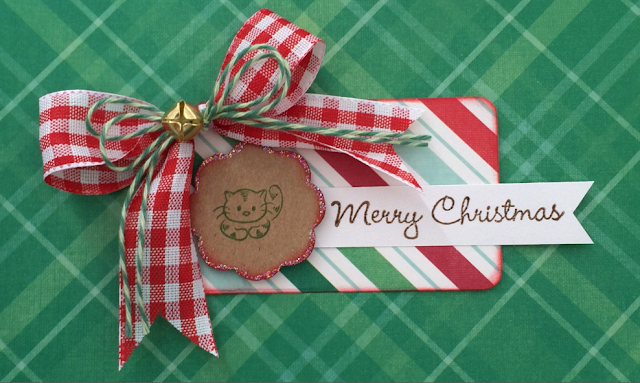 I love the very perfect bow you created, and that little kitty looks so festive. Nice way to use glitter around the scalloped edges--I've gotta remember to try that! Is the paper hand made or is it designer paper, I love it. Beautifu. How cute! And I love the sweet touch of the green twine on top of the red gingham bow. pretty card. gotta love twine! Really cute tag. I like the big bow tied with the twine! Kerri, I love that twine bow layered up with the gingham bow! Gorgeous card!